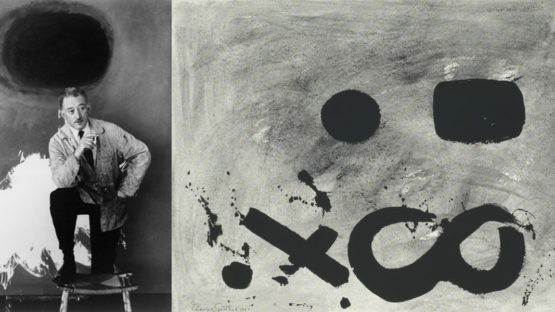 Adolph Gottlieb was an American painter, born on March 14, 1903 in New York. He was a pioneer of the Abstract Expressionism movement, working closely with other artists seeking new ways of self-expression. He left high school when he was 16 and enrolled in the Art Students League in New York where he studied painting under Robert Henri and John Sloan. In 1921 Gottlieb worked on a steamer for his passage to Europe. He took classes at the Académie de la Chaumière in Paris and later traveled to Munich and Berlin. Returning to New York in 1923, he finished high school and for the next six years studied at art schools in the city. He was awarded a joint prize in the Dudensing National Competition in 1929 and in the following year shared a two-man exhibition with Konrad Cramer at Dudensing Galleries in New York. In the early 1930s he met Mark Rothko and Milton Avery, painters at the Art Students League, who represented the expressionist movement in America at the time. Thus, in the 1930s Gottlieb turned inward to representations of his own character and philosophy rather than explicit social themes, even though during this period he was an easel painter for the Work Projects Administration Federal Art Project. As his interest in primitive art forms emerged, anticipating his “pictographic” paintings of the 1940s, Gottlieb won a U.S. Treasury competition for a post office mural in Yerrington, Nevada. In 1937 Gottlieb moved to the desert near Tucson, Arizona, an environment whose flora and relics contributed to a transformation in his subject matter and in his approach to painting. These abstract forms required an abstract environment in which to exist, and Gottlieb supplied this by tipping the table on which the still-life objects were placed. This moved the surface sharply toward the picture plane, flattening and reducing the space. He also compartmentalized objects as if by a personal mental discipline of sorting and regrouping. His palette then was rather limited, employing the soft earth colors of his environment. He returned to New York in 1939. Gottlieb began to paint what he called Pictographs in 1941. Again, it was the change in subject matter that provided some resolution for his problems with form. As he reported in 1955, “It was necessary for me to repudiate so-called ‘good painting’ in order to be free to express what was visually true for me.” In the early pictographs, symbols or images remained recognizable and close to figuration, bits of nature or man-made objects, for example. These shapes, juxtaposed or overlapped in the composition, gradually became more abstract. The flattened images were applied to canvas with thick impasto and loose brush strokes and were organized into regular or irregular grid systems. The horizontal tiers and vertical rows seem to lend meaning to the otherwise static images. In a statement to the New York Times in 1943, Gottlieb and Mark Rothko summarized their aesthetic beliefs: “We want to reassert the picture plane. We are for flat forms, because they destroy illusion and reveal truth.” By the end of the 1940s Gottlieb’s images transcended narrative or illustrative connections. The particular identities of the shapes became obscure, but while they denied reference to a specific image, they acquired meaning as pure form. Archer (1951), a work which shows the transition from the pictographs to the imaginary landscapes, keeps residual regulations of the formerly divisive lines, but these are now placed randomly on the canvas. This looser linear arrangement is combined with two motifs, focused in the upper and lower zones, which are then more subtly repeated, in different colors, over the surface of the picture. The imaginary landscapes release the grid structure completely and become increasingly non-representational. They abandon recourse to mythical symbols and show Gottlieb’s exploration of pure form and color. Gottlieb’s most effective works were his oppositions of both colors and shapes in canvases called Bursts. In these paintings the picture plane is divided into two arbitrary horizontal zones. In one of these zones is placed a bright geometric form or an irregular aggregation of brushstrokes (Glow, 1966). For him, such intangible and illusive images were representations of his deepest inner feelings. His desire for pure expression was fulfilled with color and form arranged with apparent disregard for both subject and object, the simple depiction of a complex thought. In the 1960s Gottlieb’s work received increasing acclaim. Among other honors, he was awarded the Grand Premio at the VII Bienal de São Paolo, Brazil. In 1968 a major retrospective exhibition was organized jointly by the Whitney Museum of American Art and the Guggenheim Museum in New York. Gottlieb suffered a stroke in 1971, but continued to paint from a wheelchair. The following year he was elected to the National Institute of Arts and Letters, a tribute to his teaching and to his artistic innovation and production. He died in Easthampton, New York on March 4, 1974.